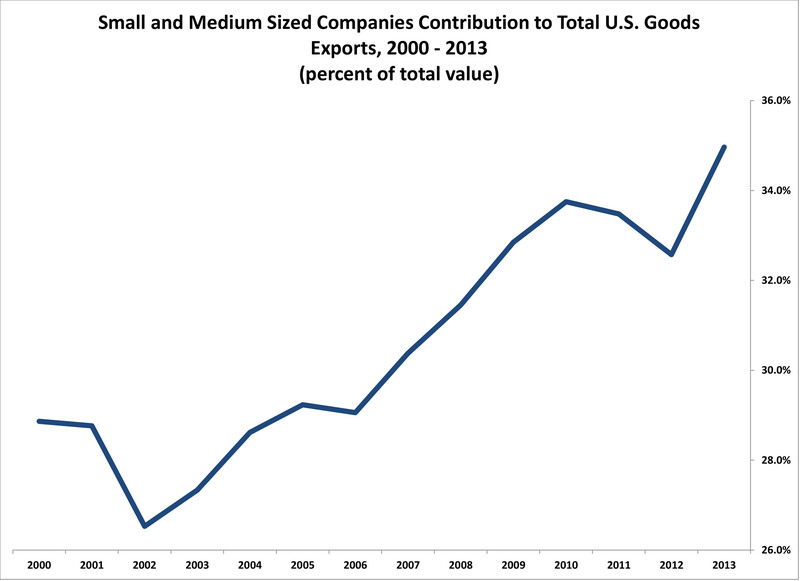 Home › The Commerce Blog › 2015 › January › Data Snapshot: How Much Do Small- and Medium-sized Businesses Contribute to U.S. Exports? 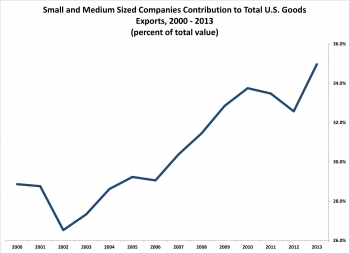 Data Snapshot: How Much Do Small- and Medium-sized Businesses Contribute to U.S. Exports? Guest blog post by Jane Callen, Economics and Statistics Administration. Following on the President’s remarks, we thought it would be valuable to take a quick “data snapshot” of the most recent annual report on exporting companies published by the U.S. Census Bureau. The 2014 report shows that small-and-medium-sized companies continue to contribute a larger share of our exports than in the past. As the below graph shows, in 2013 (the most recent year for which we have data), these companies accounted for approximately 35 percent of total goods export value -- continuing a steady growth trend of the past decade. Exports of American products overseas are important to the economic health of the U.S., and these data highlight the significant ongoing role of small-and-medium-sized companies. Stay tuned to this space for regular data “snapshots” of what is happening in the world around us, as seen through our statistical lens.